When we saw our 2009 Waits-Mast, Deer Meadows Pinot Noir from Anderson Valley and our 2009 Waits-Mast, La Encantada Pinot Noir from Sta. 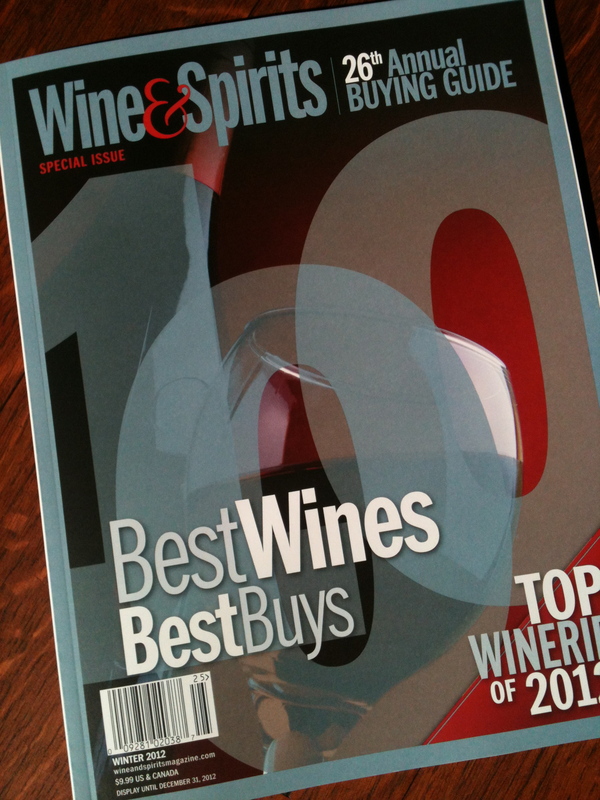 Rita Hills featured in Wine & Spirits‘ April 2012 issue of 129 Best American Pinot Noirs, we were very excited and honored. With a 94 point rating for the Deer Meadows and a 91 point rating for the La Encantada, it was great to be featured amongst other leading Pinot Noir from California and Oregon. But when we found out that the 2009 Waits-Mast from Deer Meadows Vineyard was going to be included in Wine & Spirits‘ 100 Best Wines of 2012 in their 26th Annual Buying Guide (on newsstands this week), we were downright dumbfounded. Not because the wine isn’t a very special wine – it is a complex, layered and nuanced wine that has brought some to tears – but just because we’re this little micro-boutique winery making only 200 or 300 cases per year. To be featured among 99 other amazing wines of all varietals from around the world, and among the eight Pinot Noir wines featured from California and Oregon, is thrilling, to say the least. The Deer Meadows, like many of our 2009s, has been very popular among our fans and retail and restaurant customers. We are starting to run low on inventory of this wine – we only made 48 cases and have about 10 cases left. That scarcity will continue after the 2009 vintage, as we will not have any more Deer Meadows Pinot Noir available until we bottle our 2012 vintage, so acquire some of this special wine today by going to our webstore. If you’re not in a state we ship to, San Francisco Wine Trading Company carries it online and can ship to most states. You can also find the 2009 Deer Meadows at Robert’s Market in Woodside, Canyon Market in San Francisco, and at the following Northern California restaurants: Kokkari, Liberty Cafe, Cin-Cin Wine Bar & Restaurant, Boonville Hotel and MacCallum House.